Everything we know about Titus we learn from Paul's letters; he is not mentioned by Luke in the Book of Acts. Chronologically speaking, we first see Titus as he accompanies Paul and Barnabas to Jerusalem, an event Paul references in Galatians 2:1-3 (see notes). That was the occasion of the Council of Jerusalem in Acts 15 (see notes). Even though Paul was under attack from the Judaizers who felt that all Gentile converts should be circumcised, Titus, a Gentile, declined to do so with the support of Paul himself. Later, Titus gets a lot of mention in II Corinthians (2:13; 7:6,13-14; 8:6,16,23; 12:18; 13:14). We learn from that letter that Paul had sent Titus to Corinth for the purpose of getting the contributions of the church there on behalf of the poor saints at Jerusalem. In addition, Paul had asked him to minister to them and bring back a report on their spiritual health. We then have this letter to Titus from Paul where Titus is engaged in the organization of the church in Crete, the place where Paul had left him for this purpose (Titus 1:5). Finally, during Pauls second imprisonment at Rome, Titus left him to visit Dalmatia (II Timothy 4:10, see notes), probably to minister to Believers there. The date assigned the letter depends on the reconstruction accepted for Paul’s journeys following his release from the first Roman imprisonment, as well as the dating for that imprisonment, commonly accepted as A.D. 61–63, though it may have been as early as 59-61. Since this letter makes no mention of the Neronian persecution, which apparently began in October 64, it seems best to date it between the time of Paul’s release and the commencement of that persecution. The journeys to the east indicated in 1 Timothy and Titus were apparently made as soon as he was released. The letter to Titus may have been written during the fall of A.D. 63, not long after Paul left Crete. This letter was written to Titus about the same time Paul wrote to Timothy, around 66 or 67 A.D. Paul is giving instructions to Titus regarding pastoral issues. In Paul's very first sentence, he includes a doctrinal point unique to this letter, "Paul, a servant of God, and an apostle of Jesus Christ, according to the faith of Gods elect, and the acknowledging of the truth which is after godliness." The Greek word for "godliness" there is "eusebeia," which speaks of lifestyle. It would appear that Paul intends to link a knowledge of the truth of God's Word with a Believer's actions that reflect godliness. In other words, our trust in Jesus Christ should beget a godly lifestyle. There is an issue made very clear in verse 2 regarding the promise of eternal life when he states, "In hope of eternal life, which God, that cannot lie, promised before the world began;" When you read Genesis through Deuteronomy, you scarcely find specifics on the issue of eternal life. It is obviously assumed, but not specifically stated. Paul is clear here that "eternal life" was "promised before the world began." There's no question that the righteous of the Old Testament were looking forward to eternity with God. In verse 3, Paul says, "and that's what we're preachin' about" (in so many words). Paul makes an interesting use of the Greek word "koinos" in verse 4. That's the word for "common," also used to describe the "unclean" state of Gentiles by the Jews. Paul seems to be making the point here in verse 4 that both Jews and Gentiles are saved through a "common faith." Jesus Christ has made all (Jews and Gentiles) one through faith. Paul used the terms elders (verse 5), bishops (verse 7), pastors and shepherds to describe the exact same office. Paul included a list of qualifications for this office in I Timothy 3:1-7 (see notes) as well. 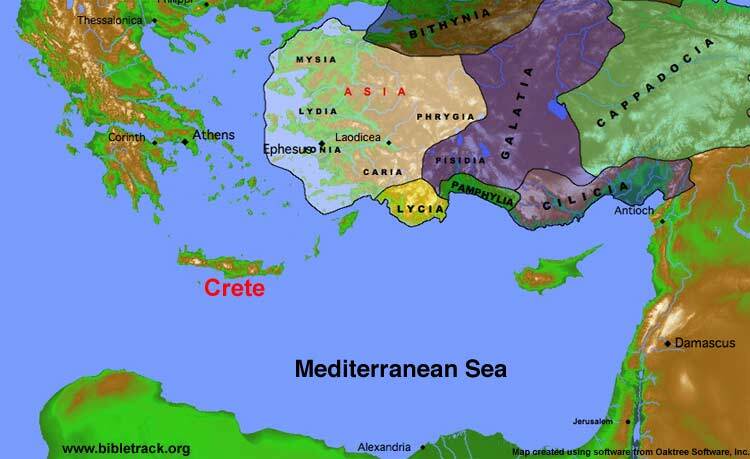 We see from verse 5 that Paul's remarks are specifically directed toward a situation of false teaching on the island of Crete (see map above). This island is about 600 miles northwest across the Mediterranean Sea toward Rome. These Elders/Bishops to be appointed in "every city" by Titus were for the purpose of combating this false teaching, which apparently was akin to the false teaching of the Gnostics. These Gnostic teachers were perverters of established Christian doctrine by mixing a little truth with oriental mysticism and Judaism. Paul puts forth an interesting point in verse 12 (see below) when he quotes what one of these false prophets had said about his own people. In other words, you can't trust what they say. Click here to read more about Gnoticism. A thorough description of the office and a complete list of qualification for Elders/Bishops/Pastors are located to the right of this window or may be accessed by clicking here to read the article entitled, "Pastors, Bishops and Elders." We should observe in this passage that Paul had no tolerance for extending an ecumenical olive branch to those who preach false doctrine. His contention throughout his ministry was that the Gospel message of salvation by grace must not be compromised. I'm reminded of David's words in Psalm 119:63, "I am a companion of all them that fear thee, and of them that keep thy precepts." This provides a sound biblical test of faith, one that Paul obviously observed himself. We see a similar warning in Paul's letter to Timothy (I Timothy 1:3-8, see notes). Notice that Paul points out that "they of the circumcision" were particularly bothersome to the preaching of sound doctrine. That term refers to the Judaizers - teachers who taught the necessity of adding Mosaic Law keeping to one's Christian faith. Nope, no friendly relations with these guys according to verse 11, "Whose mouths must be stopped." Verse 12 is rather amusing as Paul addresses the Judaizers on the island of Crete where Titus was ministering, "One of themselves, even a prophet of their own, said, The Cretians are alway liars, evil beasts, slow bellies." Jews from Crete were in Jerusalem on the day of Pentecost (Acts 2:11, see notes). Notice that these are not Paul's own words, but rather he is quoting one of the famous local poets who characterizes his own people on the island of Crete. So...these false teachers/Judaizers from Crete have a reputation that simply makes them not credible. Incidentally, Judaizers were a significant nuisance in the early church. We see that the Jerusalem Council of Acts 15 (see notes) was dedicated to the settling of the issue where converted Gentiles had, up to that point, been expected to become proselyted Jews in the process of becoming Christians...circumcision and all. The Jerusalem Council settled the issue, but Judaizers persisted for quite some time afterwards. Paul's letter to the Galatians (see notes) deals extensively with combating this false doctrine promoted by the Judaizers. So...what is Titus to do with regard to their false teaching? There's your answer in verse 13, "Wherefore rebuke them sharply." Why? He continues, "that they may be sound in the faith." Then he characterizes their doctrine in verse 14, "Not giving heed to Jewish fables, and commandments of men, that turn from the truth." Verses 15 and 16 are extremely important where Paul characterizes the false teachers themselves. Could it be that they are as sincere as Paul himself - just on a different doctrinal path? NO! He says that they are "defiled and unbelieving." He goes on to say that "even their mind and conscience is defiled." As a matter of fact, based upon the false doctrine they preach, Paul adds in verse 16, "They profess that they know God; but in works they deny him, being abominable, and disobedient, and unto every good work reprobate." There's no question, Paul was adamant that false teachers should be openly opposed by Believers. With the warning against the false teachers out of the way, Titus is told to present sound doctrine to his folks. With some detail, he is also told to present to the people the qualities of a Godly lifestyle in verses 1-10.
sober - Greek: "nephalios" means "to exercise restraint." grave - Greek: "semnos" means "befitting behavior and implying dignity and respect"
temperate - Greek "sophron" means "being sensible and moderate in ones behavior"
to be sound - Greek:" hugiaino" means "correct in one's views") in three areas...(1) faith (the ""common faith" of 1:4), (2) charity (Greek: "agape" means "sacrificial love) and (3) patience - Greek: "hupomone" means "being able to endure"
to be sober - Greek: verb "sophronizo" means "to teach them to behave in a wise and becoming manner"
to be discreet - Greek: "sophron" means "being sensible and moderate in ones behavior"
[to be] chaste - Greek: "hagnos" means "without moral defect or blemish"
[to be] good - Greek: "agathos" means "good moral qualities"
(Greek: "hupotasso" means "to submit to the orders or directives of someone"
Notice the point Paul makes with regard to this obedience is so that Christians who submit to the "word of God" will not be maligned by those who reject Christ - speaking of the cultural place of women in Roman, Greek and Hebrew society. Paul wants to make certain that this family order is not abandoned even though in Christ there is no superiority of one gender over another. [to show] gravity - Greek: "semnotes" means "behavior which is befitting, implying a measure of dignity leading to respect"
[to show] sound (Greek: "hugies" means "healthy") speech, that cannot be condemned; that he that is of the contrary part may be ashamed, having no evil thing to say of you. Not purloining (Greek: "nosphizomai" means "to misappropriate funds for ones own benefit"), but shewing all good fidelity; that they may adorn the doctrine of God our Saviour in all things. For more information regarding slavery and Paul's attitude toward it, see the notes on Ephesians 6:5-9. Why? Verses 11-13 present the "blessed hope" as the future event for which we are all looking forward. While not explicitly stated here, that's undoubtedly a reference to the rapture of Believers. Click here to get a full picture of the details of the rapture of Believers from the notes on I Thessalonians 4:13-18. This Greek combination of "blessed" (makarios) and "hope" (elpis) is unique in the New Testament to this verse. We do, however, find numerous New Testament references to the "coming" of Jesus Christ. Furthermore, with the Greek definite article appearing before (and only there in the phrase) "great God and our Savior Jesus Christ," Jesus is being described here as God incarnate. Therefore, it seems certain that the rapture of I Thessalonians 4:13-18 (see notes) is being referenced here. The saving "grace" of God (verse 11) is the means whereby all are saved in Jesus Christ (see notes on Titus 3:5 below). The Greek verb for "appeared" is a compound word - "epi" (on, over) and "phaneroo" (make manifest). The verb is in the aorist passive indicative form indicating an action that has taken place at a particular point in time. That point in time when God's grace made salvation possible speaks of the crucifixion of Jesus Christ on the cross where he paid the sin debt for everyone. Paul is literally saying that salvation became available (manifest) to "all men" when Jesus Christ died for our sins. Verse 12 then recounts the attributes of godly Christian living that were outlined in verses 1-10 (see above). Believers who lead godly lives are looking forward to the "appearing" of Jesus Christ at the rapture (verse 13). Since Jesus gave himself for us on the cross (verse 14), we are redeemed from our sins. The indwelling power of the Holy Spirit serves to "purify" us i.e. enhance our personal testimony. The KJV word "peculiar" there comes from the Greek word "periousios" which means "special." Believers are God's special people and the indwelling leadership of the Holy Spirit gives them a propensity toward good works. For more information on this leadership of the Holy Spirit, see notes on Galatians 5:16-26. Paul reinforces his comments in verse 15 when he says, "These things speak, and exhort, and rebuke with all authority. Let no man despise thee." Hey! You gotta say what you gotta say! The thoughts of chapter 2 are continued here. As he had done in his letter to Timothy, Paul reminds Titus of the importance of teaching his congregation to be subject to the government authorities in verse 1, and generally kind to all others in verse 2. (Click here to see the notes on Romans 13:1-7 regarding the proper attitude toward government authority.) Paul recalls his own past prior to salvation in verse 3, which he also recounts in I Timothy 1:13 (see notes) when he admits regarding himself, "Who was before a blasphemer, and a persecutor, and injurious: but I obtained mercy, because I did it ignorantly in unbelief." Since he actually presided over the execution of Stephen in Acts 7 (see notes), verse 3 would seem to represent Paul's spiritual state before receiving Christ as his Savior. Then we have a powerful declaration of salvation by grace in Titus 3:5. It's not works; it's grace! Salvation does not come because of works of righteousness. Salvation is made possible through an extension of God's mercy. As you can see, verse 5 clearly defines the process of salvation as the process of spiritual rebirth and Holy Spirit renovation which, according to verse 6, has been presented to us by Jesus Christ himself. For a detailed look at salvation by grace, see the notes on Ephesians 2:1-10. You may also find helpful the article entitled, "What the Bible says about eternal life." Verse 7 declares that the grace of verse 5 makes us "heirs according to the hope of eternal life." The Greek word for "hope" in every occurrence in the New Testament (KJV) is "elpis." The Greek definition for "elpis" is a little different in expression from our English word "hope." While we use the word "hope" to sometimes express a good bit of uncertainty about a future event, "elpis" is a Greek expression meaning "confident expectation" with no uncertainty with regard to the future event. But what about works? That's addressed in verse 8. Paul encourages Believers to be conscious of their personal testimony. In doing so, others are profited. And...by the way, stay away from contentious people in verses 9-11. He's specifically addressing those who spend too much time on obscure details of scripture while overlooking the predominate message of the sacrifice for sins of Jesus Christ. Regarding the word "genealogies" in verse 9, see notes on I Timothy 1:4. Note verse 10, "A man that is an heretick after the first and second admonition reject;" The Greek word for "heretick" is "hairetikos." Ooooo, notice how English just transliterated the Greek word here. It is used in the context of one who causes division over the scripture. Notice Paul's harsh judgment on this "heretick" in verse 11; the phrase "is subverted" is the Greek verb "ekstrepho" used in the perfect passive tense to indicate that he is a heretick because he already has been corrupted by this false doctrine. The heretick sins by his heresy and is condemned by his own actions. None of these statements address the issue of salvation. It is quite possible, even likely, that these so-called "hereticks" were Christians who were led astray by false doctrine, and now they are propagating that same false doctrine. This is the theme regarding harmful doctrine that Paul began in Titus 1:10-16 (see above). I heard a saying once, "The main thing is to keep the main thing the main thing." So, here it is: While you may enjoy studying the less-than-obvious details of the Old and New Testaments, don't allow yourself to come to a place where they become tests of your fellow Believers' faith. Good men disagree on peripheral issues of scripture. Paul concludes his letter with a few housekeeping issues and greetings in verses 12-15. Philemon lived in Asia Minor and received this letter from Paul somewhere between 56-62 A.D. Paul was in prison at the time. Unlike Paul's other letters, this one is more like a piece of personal correspondence to an individual regarding a third party, Onesimus. Paul had been ministered to by Onesimus, an escaped slave from Philemon's household. Now, Paul is attempting to pave the way for Onesimus to return to Philemon without the consequences that would ordinarily accompany a returning slave. For more information regarding slavery in first-century Roman society, click here to see the notes on Ephesians 6:5-9. Philemon was the guy in whose house the church met there in his hometown, an undisclosed city (verse 2). His slave, Onesimus, got loose and came to Paul where he was saved and discipled. Now, Paul is sending Onesimus back to Philemon with this letter containing a very strong recommendation that Onesimus be forgiven and restored. This is Paul's letter of recommendation to Philemon for a gracious treatment of Onesimus upon his arrival. One can't help but notice how Paul uses extreme persuasive measures in this letter on behalf of Onesimus. He begins with heavy compliments of Philemon's stand for the Lord in verses 4-7. He indicates in verse 10 that Onesimus had received Christ as Savior while with Paul. He notes in verse 11 that, while Onesimus may not have been a very good slave before, now he is ministering to Paul effectively on behalf of Philemon. In verse 12, he's sending him home. He calls upon Philemon to reinstate Onesimus as a slave with special standing in verses 15-16...even as a brother in Christ. He calls upon Philemon to charge to Paul whatever Onesimus may have cost him as a result of his flight from the household of Philemon in verses 17-18. Although, in verse 19, Paul seems to be indicating that it would be tacky on the part of Philemon to collect, given all that Paul has done for Philemon in the past. Finally, Paul indicates his desire to visit back when he is released from prison, "Fix up my room!" (verse 22). Many cite this letter of recommendation as the basis for the exchange of church letters which is commonly practiced today when one leaves one church to join another.